Tucked away deep in the hardest part of the skull hides the vestibular system, the mysterious unsung hero of the senses. Professor Alan Brichta is its number one fan. "We need the vestibular system for balance, it is specifically there to tell us, amongst other things, which way is up and which way is down," Alan asserts. "What is fascinating to me is that most of the time we just don't think about it. We don't realise this thing is working in our favour until it goes wrong." The relatively recent recognition of the existence of the sense of balance, as well as the inaccessible position of the inner ear vestibular organs within the skull, means there is a lack of evidence-based research on this system in action. To counter this, Alan and his team have developed a semi-intact model of the vestibular system, which allows for live cells to remain functional. "We are concentrating on the peripheral balance organs, the ones out in the inner ear, to see how they work, and how they communicate with the brain," he clarifies. "People talk about exploring outer space, really we are flipping that idea on its head and are trying to discover inner space." 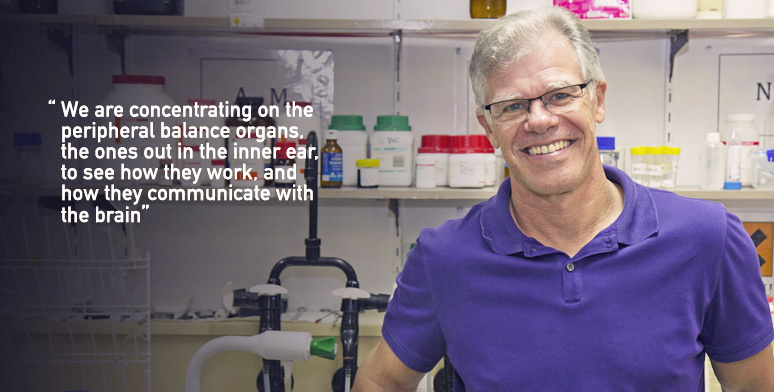 When not investigating the inner ear, Alan is Head of Discipline (Anatomy), supervisor of multiple research students, and teaching into a number of programs including the Bachelor of Medicine and the Bachelor of Biomedical Science. If you were a mysterious and misunderstood body part, Alan would be your first choice for advocate. His extensive knowledge and unbridled fascination are equally apparent as he talks up the balance system. He embodies a fervent team supporter as he derides the other senses for not being nearly as important. "The vestibular system is how you remember which direction you came from, and is responsible for you knowing where you are as you move through your environment," Alan explains. "You can thank it for your awareness of whether you are lying down or standing up, and for knowing which way to swim to reach the surface of the water." "Importantly, it keeps your eyes steady when your body is moving, so your vision is more steadycam than jumpy jumble. It is so finely tuned," he discloses, "that drinking alcohol can cause it to make you wobbly, and echo wobbly the next day as it works to compensate for your previous night's wobbliness." Unlike the other senses, the vestibular organs don't report back to one specific part of the brain, instead sending and receiving communications with many sections of the brain. Which Alan believes is proof of the critical importance of balance information to normal brain function. "I think it's the way it works so exquisitely well for the most part that really fascinates me," Alan muses. "What is also fascinating to me, is that most of the time we just don't think about it." "The balance system works so well and with such little fanfare, that when something goes wrong our world is thrown into complete disarray." Alan explains that malfunction within the vestibular system can have devastating affects on quality of life. "The balance system itself will never kill you directly, but the resulting falls, especially in the aged, can lead to fatal consequences," Alan asserts. "Breaking a leg, or worse still a pelvis, that's going to lead to all sorts of problems." It's not just fear of injury that affects those with dizziness. Alan cites understandable anxiety over the possibility of creating a scene or damaging property whilst falling, as two scenarios which may make sufferers stay at home. Due to the similarities between the effects of excessive alcohol and balance problems, accusations of drunkenness can cause further embarrassment. "It's remarkable how quickly people do lose confidence," Alan reveals. "And as a result, it's a hidden problem because we rarely, if ever, see people with balance problems, they are not generally out in the community." "Whenever we have a public forum on balance and dizziness, however, it's amazing how many people attend because they are desperate to find a cure for themselves or their loved ones." Milder effects of vestibular interruption are relatively common and can be countered. "The brain is capable of a lot of plasticity, or modulation," Alan states. "If the brain recognises that the signals aren't coming in quite as well as they used to, it might amplify or boost the incoming signal." "But it can only do so much to compensate. People who have tried everything, from physiotherapy to medications to operations with little or no effect can have a very poor quality of life." Despite the debilitating nature of balance problems, a lack of knowledge in this area means that optimum treatments are yet to be identified. "The sad thing is we have no real treatment. We can give you sedatives; we can give you things that reduce your activity and maybe your anxiety," Alan says. "But really there is nothing at all we can do to stop that dizziness. Because we don't know how it works, we don't know what happens when it goes wrong, or what drugs could be specifically aimed at treating the problem." "And this is why we need more studies." The balance system is almost completely inaccessible, positioned within the thickest part of the skull, rendering the study of its working actions very difficult. "Using an animal model, we were amongst the first to look at it as a semi-intact system, that's our specialty," Alan confirms. As a result of their use of this system, Alan and his team have been able to test existing theoretical frameworks and generate evidence regarding previously unobserved functions. "We can't always learn about functions from studying the parts, or by using modeling," Alan explains. "We are at such a primitive stage of understanding that we need to study the system in action to advance our knowledge." His most recent NHMRC-funded research has focused on the efferent branch of the vestibular system – the feedback pathway by which the brain can modulate inner ear sensitivity. Ultimately, Alan is hoping that the work being completed by his team will result in a major improvement in the quality of life of people suffering from balance problems. "By listening in on the communication between the inner ear organs and the brain, we are trying to decode the kinds of information that the brain is interested in," Alan explains. "And if we do that, then maybe we can replace it if it is damaged, or supplement it as we age." Although we accept that our hearing is likely to be affected by age, Alan points out that it is less commonly understood that balance, which uses similar receptors or sensory cells, can also be impacted by aging. "So if we could develop a system whereby you had a prosthesis or an aid, that would be a boon to anyone who has balance problems, particularly the elderly." Alan notes that technologies such as accelerometers and gyroscopes have shrunk in size and cost to the extent that they could be easily incorporated into a non-obtrusive aid. "It could be like a hearing aid, but for the balance system," Alan suggests. "It might be on a set of glasses, or possibly it could be a chip close to, or attached to the skull. It would then generate electric signals that would help the brain to know the position of our head in three-dimensional space." "It's one of our major goals. But first we have to understand how it works to be able to fix it," he admits. "At least in our case, because there is not that much known about it, and so few people working on it, we might just discover something really important tomorrow." "Usually though, it's just little 'balanced' steps toward gaining more knowledge." Professor Alan Brichta's primary research interest is balance and the vestibular system. Professor Alan Brichta's primary research interest is balance and the vestibular system. His most recent NHMRC-funded research has focused on the efferent branch of the vestibular system – the pathway by which the brain can modulate inner ear sensitivity. Despite fifty years of ongoing research, the functional purpose of the efferent vestibular system still remains a mystery – most likely due to its inherently complex mechanisms of action. To combat this, Alan has developed a semi-intact model of the vestibular system, which allows for faithful, high-resolution recordings of hair cell function. This recording technique has provided new information about the efferent vestibular system, with particular regards to the novel alpha-9 nicotinic receptor. Alan has ongoing collaborations with vestibular experts Dr Americo Migliaccio (Neuroscience Research Australia; NeuRA), Dr Joseph Holt (University of Rochester, USA) and Dr Richard Rabbitt (University of Utah, USA), as well as HMRI neuroscientists Professor Bob Callister and Dr Doug Smith. He is also closely affiliated with the Garnett Passe and Rodney Williams Memorial Foundation (GPRWMF), and the Neuro-Otology Society of Australia (NOTSA). 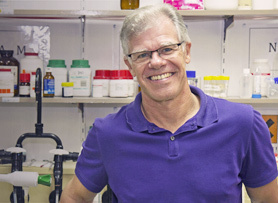 Alan is currently the Head of Discipline (Anatomy), supervises multiple PhD students, and teaches into a number of programs including Bachelor of Medicine and Bachelor of Biomedical Science. What intrigues you most about the vestibular system? I know it may sound a little strange but almost from the moment I learned about the vestibular system, I've been fascinated and intrigued by the subtle and mysterious way it works to provide us with a sense of balance. The vestibular system allows us go about our daily activities, correcting almost every move we make, so that we don't fall over. And it does this with little or no fanfare or even very much recognition. The vestibular system is neither blatant nor does it intrude on our consciousness with the flamboyance of primary senses such as vision and hearing. If the vestibular system is doing its job properly it is almost imperceptible, working away with exquisite precision, speed, and accuracy. Perhaps it is precisely this 'backstage activity' that is responsible for our general lack of awareness and why we know so much less about this system in comparison to its close cousin, the hearing or auditory system. In short, the more I get to know the vestibular system the more I am in awe of the 'no nonsense' way in which it influences almost all aspects of our lives, making it the 'quiet achiever', or dare I say, the unsung hero or heroine of the central nervous system. Alan Brichta is a neurobiologist with research interests in the anatomy and physiology of peripheral and central vestibular system. In particular, his studies have focused on vestibular hair cells and their associated primary afferents and has recently developed an isolated preparation of the mouse inner ear to study these unusual cellular components. This approach allows stable, high-resolution, intracellular recordings whilst the tissue undergoes near 'natural' (mechanical), rather than artificial (electrical) stimulation. Results from these studies are helping us understand the cellular mechanisms underlying normal and abnormal function associated with the peripheral vestibular apparatus. In addition, Dr. Brichta is studying vestibular nucleus neurons in the brainstem that are the major recipients of transmitted vestibular organ output. These regions are thought to be highly modifiable and may prove to be ideal targets for rational therapeutic strategies aimed at treating balance disorders. Dr. Brichta was awarded a prestigious five year Garnett Passe and Rodney Williams Memorial Foundation Senior/Principal Research Fellowship. Vestibular electrophysiological and anatomical techniques, including whole-cell patch-clamp recordings together with intracellular labelling and immunohistochemistry. 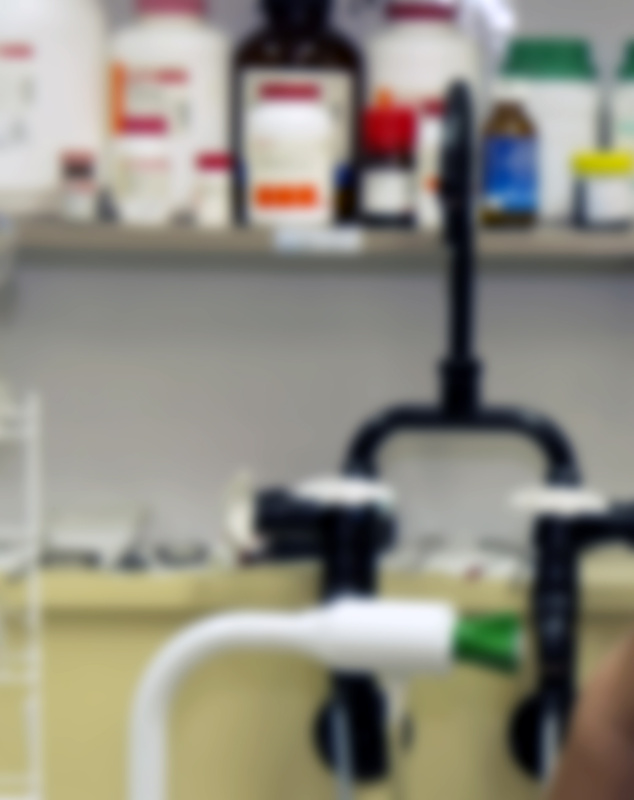 Experience with in vivo and in vitro preparations. Awarded major nationally competitive grants: Continually funded NHMRC Project Grants; Garnett Passe and Rodney Williams Memorial Foundation Invited Speaker at the Royal College of Medicine, London, UK. Head of the Anatomy and his teaching expertise is in histology, neuroanatomy, and neurosicence. Has helped with major reorganisation of core anatomy courses to Medicine, Biomed Sci, Health Sciences, including Medical Radiation Science, Physiotherapy, Oral Health, and Speech Pathology. Developed three new specialist subjects: Oral Health, Speech Pathology, and Neural Visceral Anatomy. Re-designed second semester Neuroanatomy block for Medicine. Hosted the Universitys first US Fulbright Scholar. Help organise teaching in new Anatomy facility - Medical Sciences West. Currently, Co-Director of the University of Newcastle Priority Research Centre for Brain and Mental Health. Is an NHMRC Assigners Academy member, an Associate Editor for the Journal of Association for Research in Otolaryngology, and is the Chair of the International Committee of the Association for Research in Otolaryngology. Former member of University Research Committee, Academic Senate, and Faculty Board during a period of major change in teaching and learning at the University. Attracted significant equipment funding to the EM /X-Ray Unit with a successful application for nationally competitive ARC-LEIF grant. Submission of Anatomy discipline Roadmap for Australian Medical Accreditation Committee. Contributed to the development of the Bachelor of Podiatry Program. Provided Biomedical Science input with regard to course provisions and assessment of background course pre-requisites. Member of NHMRC Grant Review Panel. External Ph.D. Examiner of Higher Degree Research Students. In addition to his own studies on the vestibular system, Dr. Brichta has had a long-term collaboration with his good friend and colleague, Dr. Bob Callister. Together they have had over thirty years of collaborative efforts on sensory and motors systems. In addition Dr. Brichta collaborations with Neuroscience Research Australia (Sydney), the University of Utah, University of Rochester, and University College London. Organisation: The Royal Society of Medicine, London Description: Much of what we have learned about the human body has come not from direct observations but has been inferred from animal studies. Fortunately, as we have learned from the human and other genome projects, we are almost genetically identical to chimpanzees and remarkably similar to mice. Sequencing of the mouse genome for example, completed in late 2002, estimates a gene count of 23,786 and for comparison, humans are estimated to have 23,686 genes – a hundred fewer! Therefore, it can be argued that what we learn in mice is applicable to humans. This assertion is most likely true when it comes to ancient and evolutionarily conservative sensory systems such as the peripheral vestibular system. To date, however, its residence deep within the hardest bone of the skull (making it neither easy to access nor convenient to manipulate) has hampered our study of the vestibular organs of the inner ear. To overcome this significant technical obstacle we have developed a surgically isolated inner ear of the mouse. This preparation allows us unprecedented access to the workings of the organs of balance. Indeed, using our isolated in vitro preparation and altering the volume of inner ear fluid by only a few nano-litres we have observed anomalous neuronal activity that may contribute to the symptoms of Meniere’s disease. By stripping the isolated inner ear preparation still further, (like layers in an onion) but carefully preserving the important and unique micro-architectural features of the individual organs, we have discovered a novel way in which the important motion detectors of the vestibular system (hair cells) communicate with their closely associated nerve afferent nerves. These results would have been difficult if not impossible to obtain without semi-intact preparations of vestibular organs. Despite these notable advances one must acknowledge that these results are from a very small mammal that weighs four orders of magnitude less than an adult human (7 grams vs. 70 kilograms). Therefore, are any of these findings relevant to humans? To address this fundamental issue we have begun to isolate viable inner ears from post-mortem human foetal tissue (10 to 18 weeks gestation). This means we can now apply some of the techniques we have learned using mice to in vitro human vestibular tissue. The preliminary results are promising. We are able to record activity from foetal hair cells and nerve terminals up to 8 hours after the tissue arrives in the laboratory. Our data suggest the human peripheral vestibular system is fully functional midway through the second trimester and indeed resembles a 3 week old, fully weaned, postnatal mouse. Taken together, these various approaches provide us with new insights into basic machinery of the peripheral balance organs in humans. Our ultimate goal is to have the findings from these animal and foetal models translated into targeted clinical therapeutics. For example, due to pathological increases in endolymph volume, we believe the membranous labyrinth is distended causing abnormal and confusing signals to the brain. Alleviating these volume changes by pharmacological and/or surgical intervention would eliminate distensions and accompanying vertiginous attacks. Similarly, based on our new understanding of the key role potassium plays in vestibular organ function, particularly between hair cells and primary afferents, suggests this ion is tightly regulated to ensure normal balance function. Thus a focus on restoration and maintenance of potassium in the inner ear would be a clinical requirement. In short, our continued hope is that better basic understanding leads to targeted diagnostic and therapeutic strategies for treating the debilitating effects of balance disorders. © 2019 Elsevier Ltd The aetiology of schizophrenia is complex, heterogeneous, and involves interplay of many genetic and environmental influences. While significant progress has been made in the understanding the common heritable component, we are still grappling with the genomic encoding of environmental risk. One class of molecule that has tremendous potential is miRNA. These molecules are regulated by genetic and environmental factors associated with schizophrenia and have a very significant impact on temporospatial patterns of gene expression. To better understand the relationship between miRNA and gene expression in the disorder we analysed these molecules in RNA isolated from peripheral blood mononuclear cells (PBMCs) obtained from an Australian cohort of 36 individuals with schizophrenia and 15 healthy controls using next-generation RNA sequencing. Significant changes in both mRNA and miRNA expression profiles were observed implicating important interaction networks involved in immune activity and development. We also observed sexual dimorphism, particularly in relation to variation in mRNA, with males showing significantly more differentially expressed genes. Interestingly, while we explored expression in lymphocytes, the systems biology of miRNA-mRNA interactions was suggestive of significant pleiotropy with enrichment of networks related to neuronal activity. Copyright© Bentham Science Publishers; For any queries, please email at epub@benthamscience.net. BACKGROUND: Deterioration in vestibular function occurs with ageing and is linked to age-related falls. Sensory hair cells located in the inner ear vestibular labyrinth are critical to vestibular function. Vestibular hair cells rely predominantly on oxidative phosphorylation (OXPHOS) for energy production and contain numerous mitochondria. Mitochondrial DNA (mtDNA) mutations and perturbed energy production are associated with the ageing process. OBJECTIVE: We investigated the effects of ageing on mtDNA in vestibular hair and support cells, and vestibular organ gene expression, to better understand mechanisms of age-related vestibular deficits. METHODS: Vestibular hair and supporting cell layers were microdissected from young and old rats, and mtDNA was quantified by qPCR. Additionally, vestibular organ gene expression was analysed by microarray and gene set enrichment analyses. RESULTS: In contrast to most other studies, we found no evidence of age-related mtDNA deletion mutations. However, we found an increase in abundance of major arc genes near the mtDNA control region. There was also a marked age-related reduction in mtDNA copy number in both cell types. Vestibular organ gene expression, gene set enrichment analysis showed the OXPHOS pathway was down regulated in old animals. CONCLUSION: Given the importance of mtDNA to mitochondrial OXPHOS and hair cell function, our findings suggest the vestibular organs are potentially on the brink of an energy crisis in old animals. © 2016 Elsevier Inc. Prevailing evidence indicates a relatively late life decline in human vestibulo-ocular reflex (VOR) function. Although mice are commonly used in mechanistic studies of vestibular function, it remains unclear whether aging produces a corresponding decline in VOR function in mice. We sought to determine how the baseline VOR and its short-term adaptation were affected by aging. We tested 8 young (3-month old) and 8 aged (30-month old¿equivalent to a ~80-year old human) C57BL/6 mice. We measured their VOR response to whole-body static tilts and during 0.1¿10¿Hz whole-body sinusoidal and transient rotations before and after VOR adaptation training. Our data revealed minimal differences in static counter-tilt response between young and aged mice, but a significant deficit in baseline VOR gain in aged mice during transient rotations. Moreover, aged mice had a significant decrease in short-term VOR adaptation, particularly for training that sought to decrease the VOR response. © 2016 the American Physiological Society. In the present study we combined electrophysiology with optical heat pulse stimuli to examine thermodynamics of membrane electrical excitability in mammalian vestibular hair cells and afferent neurons. We recorded whole cell currents in mammalian type II vestibular hair cells using an excised preparation (mouse) and action potentials (APs) in afferent neurons in vivo (chinchilla) in response to optical heat pulses applied to the crista (¿T ¿ 0.25°C per pulse). Afferent spike trains evoked by heat pulse stimuli were diverse and included asynchronous inhibition, asynchronous excitation, and/or phase-locked APs synchronized to each infrared heat pulse. Thermal responses of membrane currents responsible for APs in ganglion neurons were strictly excitatory, with Q10 ¿ 2. In contrast, hair cells responded with a mix of excitatory and inhibitory currents. Excitatory hair cell membrane currents included a thermoelectric capacitive current proportional to the rate of temperature rise (dT/dt) and an inward conduction current driven by ¿T. An iberiotoxin-sensitive inhibitory conduction current was also evoked by ¿T, rising in <3 ms and decaying with a time constant of ~24 ms. The inhibitory component dominated whole cell currents in 50% of hair cells at -68 mV and in 67% of hair cells at -60 mV. Responses were quantified and described on the basis of first principles of thermodynamics. Results identify key molecular targets underlying heat pulse excitability in vestibular sensory organs and provide quantitative methods for rational application of optical heat pulses to examine protein biophysics and manipulate cellular excitability. Inhibitory synaptic inputs to hypoglossal motoneurons (HMs) are important for modulating excitability in brainstem circuits. Here we ask whether reduced inhibition, as occurs in three murine mutants with distinct naturally occurring mutations in the glycine receptor (GlyR), leads to intrinsic and/or synaptic homeostatic plasticity. Whole cell recordings were obtained from HMs in transverse brainstem slices from wild-type (wt), spasmodic (spd), spastic (spa), and oscillator (ot) mice (C57Bl/6, approximately postnatal day 21). Passive and action potential (AP) properties in spd and ot HMs were similar to wt. In contrast, spa HMs had lower input resistances, more depolarized resting membrane potentials, higher rheobase currents, smaller AP amplitudes, and slower afterhyperpolarization current decay times. The excitability of HMs, assessed by "gain" in injected current/firing-frequency plots, was similar in all strains whereas the incidence of rebound spiking was increased in spd. The difference between recruitment and derecruitment current (i.e., ¿I) for AP discharge during ramp current injection was more negative in spa and ot. GABA A miniature inhibitory postsynaptic current (mIPSC) amplitude was increased in spa and ot but not spd, suggesting diminished glycinergic drive leads to compensatory adjustments in the other major fast inhibitory synaptic transmitter system in these mutants. Overall, our data suggest long-term reduction in glycinergic drive to HMs results in changes in intrinsic and synaptic properties that are consistent with homeostatic plasticity in spa and ot but not in spd. We propose such plasticity is an attempt to stabilize HM output, which succeeds in spa but fails in ot. © 2014 the American Physiological Society.